Endodermal organs such as the lung, liver and pancreas emerge at precise locations along the primitive gut tube. Although several signalling pathways have been implicated in liver formation1,2, so far no single gene has been identified that exclusively regulates liver specification. 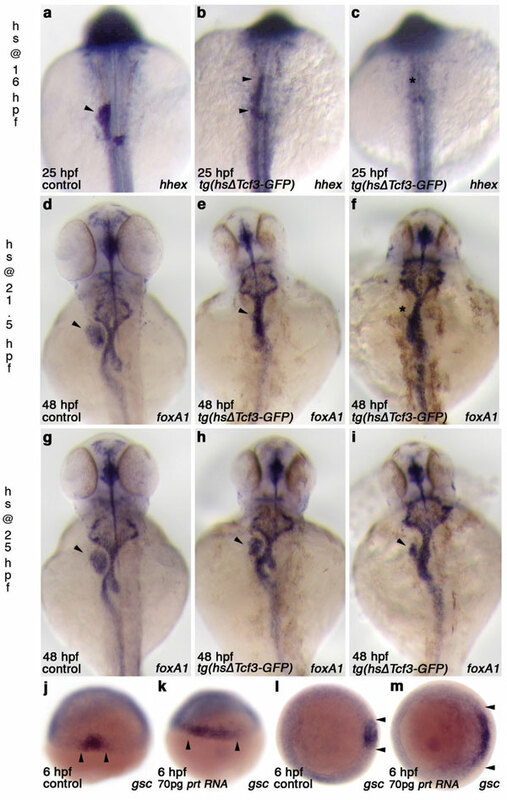 In zebrafish, the onset of liver specification is marked by the localized endodermal expression of hhex and prox1 at 22 hours post fertilization. Here we used a screen for mutations affecting endodermal organ morphogenesis to identify a unique phenotype: prometheus (prt) mutants exhibit profound, though transient, defects in liver specification. 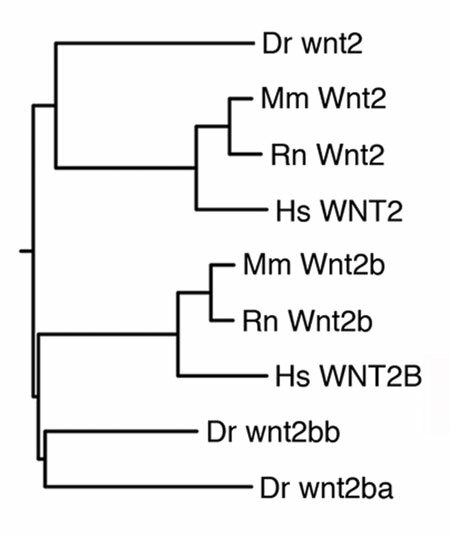 Positional cloning reveals that prt encodes a previously unidentified Wnt2b homologue. prt/wnt2bb is expressed in restricted bilateral domains in the lateral plate mesoderm directly adjacent to the liver-forming endoderm. Mosaic analyses show the requirement for Prt/Wnt2bb in the lateral plate mesoderm, in agreement with the inductive properties of Wnt signalling. Taken together, these data reveal an unexpected positive role for Wnt signalling in liver specification, and indicate a possible common theme for the localized formation of endodermal organs along the gut tube. We thank all the members of the Stainier laboratory for their support during the screen; A. Ayala, S. Waldron and N. Zvenigorodsky for expert help with the fish; L. Trinh, S.-W. Jin, H. Knaut and J.-P. Vincent for discussions and critical readings of the manuscript; S. Pleasure for providing a Prox1 antibody before commercialization; and R. Dorsky for providing Tg(hsΔTcf3-GFP). E.A.O. was supported by the UCSF Liver Center through an NIH pilot feasibility grant, and H.V. by a long-term fellowship of the Human Frontier Science Program. This work was supported in part by grants from the NIH (NIDDK) and the Packard Foundation to D.Y.R.S. The prt/wnt2bb sequence is deposited in GenBank under accession number DQ231559. Reprints and permissions information is available at npg.nature.com/reprintsandpermissions. The authors declare no competing financial interests. Correspondence to Elke A. Ober or Didier Y. R. Stainier.